The lateral border of the tongue is a common location for development of squamous cell carcinoma. This hardened, rolled (indurated) outer border of the lesion, and ulcerated center, are common presenting signs. Every year, worldwide, more than 500,000 patients receive the diagnosis of squamous cell carcinoma (SCC) of the head and neck. Squamous carcinoma develops in the outer layers of the skin. Due to the various oral sites at which it may develop, the symptoms can include sore throat (pharyngitis), difficulty swallowing (dysphagia), painful swallowing (odynophagia), and hoarseness. 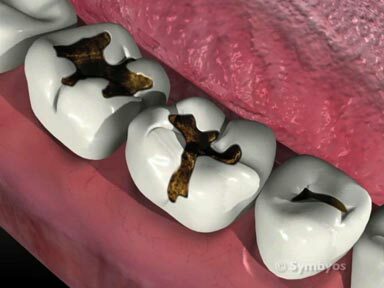 These symptoms are especially significant if they do not resolve completely within ten to fourteen days, and should be evaluated by a dentist or physician. Sometimes early lesions may not be accompanied by any symptoms at all. Other clinical findings include a report of continuous enlargement of the lesion. SCC is more common in males in the United States. 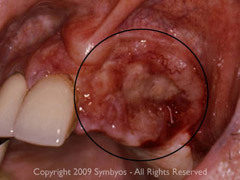 Females from Asia/ India have a higher incidence of leukoplakia (white lesions) developing into SCC. When present, pain can be localized or referred, often to the ear. A tingling sensation or numbness (paresthesia) in the lower lip may also be present. Bleeding may occur, and a fissure may develop, which does not heal. This is especially true on the lips. Early diagnosis is essential for a positive outcome. Due to the nature of oral mucosa, benign and malignant tissues can be difficult to tell apart until later stages. Because of this dilemma, 50% of patients have evidence of lymph node metastasis at the time of diagnosis—greatly worsening the prognosis. 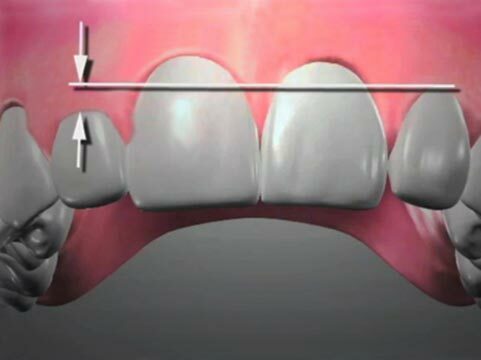 Early detection has improved in recent years through the use of various tests that can improve a dentist’s ability to visualize abnormal tissues. Risk factors for oral cancer include tobacco (historically, about 75% of oral cancer patients have been tobacco users); alcohol, solar radiation, genetic predisposition, nutritional deficiency (iron-deficiency anemia in Plummer Vinson syndrome), immunosuppresion and infections (candidal leukoplakia and human papillomavirus infections HPV-16/18). Combined use of alcohol and tobacco significantly increases the risk of oral cancers. In recent years, the number of patients who develop oral cancers in the absence of common risk factors has been on the rise, particularly in young men. This is believed to be related to the increased incidence of human papillomavirus. 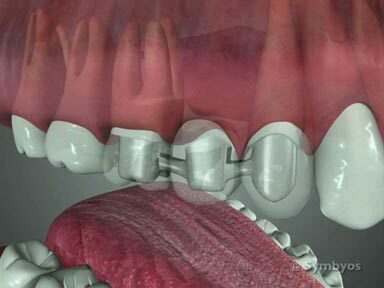 How does the dentist diagnose Oral Cancer? 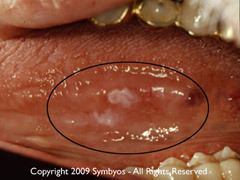 Figure 1: Squamous cell carcinoma may occur on the gingiva, although it is most common on the lateral borders of the tongue, floor of the mouth, lips and back of the throat. Except for the lips, these locations are located in what is sometimes referred to as Waldeyer’s Ring. (Image courtesy Victor Raposo, DMD). Figure 2: Locally invasive squamous cell carcinoma, which arose in the vestibular gingiva of the patients left anterior maxilla. (Image courtesy Victor Raposo, DMD). 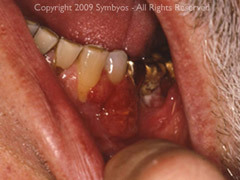 Figure 3: Squamous cell carcinoma of the tongue. The asymmetrical, mixed red and white lesion with irregular borders is commonly associated with cancerous growths. (Image courtesy Victor Raposo, DMD). Figure 4: Another squamous cell carcinoma, arising on the lateral border of the tongue. (Image courtesy Victor Raposo, DMD). A cytologic smear or brush biopsy can be performed from the ulcerated surface or intact, but suspicious appearing mucosa. This means cells are harvested from the lesion and transferred to a microscope slide, where they are stained and prepared for microscopic evaluation. Tissue biopsy and microscopic examination is necessary to confirm the diagnosis, although clinical impression (how the lesion appears visually and behaves over time) is also very important. Scientists are searching for biomarkers in saliva, an easy to obtain body fluid, for noninvasive detection of oral cancer and possibly other forms of cancer. A tissue sample may also be harvested traditionally, either in part (incisional biopsy) or or via complete removal of the lesion (excisional biopsy). This is typically done with a scalpel. Visual examination often uncovers the presence of oral cancer. 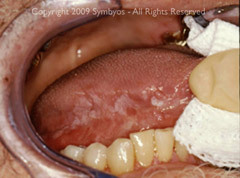 The visual cues upon examination are: deep seated ulcerated mass (extending into adjacent tissues), fungating ulcerated mass (extending away from the adjacent tissues), the ulcerated margins are commonly elevated, adjacent tissues may be indurated (hardened or thickened), may have residual leukoplakia and/or erythroplakia, and SCC most often occurs on the posterior lateral tongue, oropharynx and floor of the mouth—an area known as Waldeyer’s Ring. Oral cancer screening tests are now available to assist the doctor at early detection of cancers that may otherwise be difficult to identify through visual examination. Squamous cell carcinoma may present as mixed white and red lesions, which can be ulcerated, elevated, or a combination of these. The borders are frequently irregular, and small columnar outgrowths may be present. Fissuring may also be noted. (Image courtesy Victor Raposo, DMD). Another mixed red and white lesion, which was diagnosed as squamous cell carcinoma of the tongue. (Image courtesy Victor Raposo, DMD). Common treatment options for squamous cell carcinoma of the oral cavity and oropharynx may include a combination of surgery, radiation, and chemotherapy where indicated. Scheduled periodic re-evaluation is essential due to possible recurrence. Smoking cessation, if applicable, is also critically important to recovery and achieving the best possible prognosis. A small, raised, slightly pigmented nodule on this patient’s ear turned out to be a moderately aggressive basil cell carcinoma with some degree of squamous cell differentiation. Removing it took three hours and microscopic sections from the lesion were analyzed during the procedure, to ensure complete removal. This patient presented two years prior to this photograph with a nodular lesion on the left cheek, which she elected not to have treated. At the time she returned for care, her chief complaint was inability to eat properly. The lesion was ultimately diagnosed as advanced basal cell carcinoma.